The photos that you take while traveling are among the most treasured keepsakes you'll be able to take home from your trip. You don't want to come back after an overseas vacation only to find that your memory card is corrupted or your cell phone isn't working! Be sure to utilize multiple backup methods so you'll never lose a single shot. 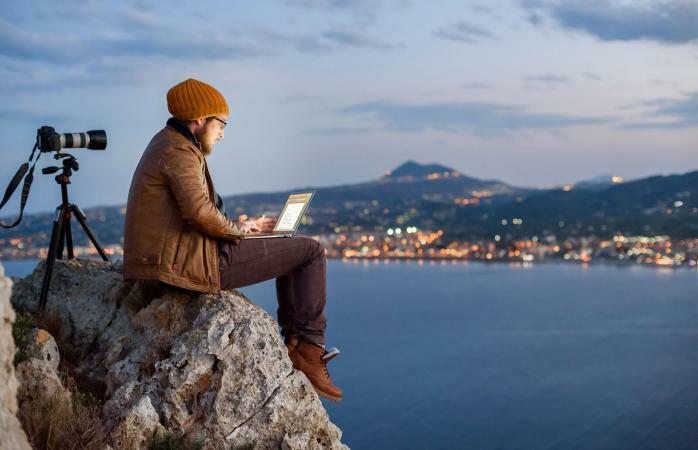 If you anticipate you will have fast and reliable Internet access at your destination, leveraging one of the many free cloud storage services is one of the easiest ways to back up your photos. This is especially convenient with pictures you take on your smartphone because you can usually configure the mobile app to back up your photos automatically. Several of these services have the added benefit of allowing you to share photos online with ease. What Should I Put on Luggage Tags? Microsoft OneDrive, Dropbox, Amazon Prime Photos and Google Photos are among some of the most popular options in cloud storage of photos and videos. Each come with the option to upgrade for more online storage. If you would like to have the power of cloud storage while retaining greater control and access over your files, then you might consider investing in a personal network attached storage (NAS) device. The NAS is set up in your home or office. It's like an external hard drive, but instead of connecting it to a computer, it connects to your router. This way, it's able to go online. From there, using the corresponding app or web interface (based on the manufacturer), you can access the files you have saved on it as well as save new files to it. While the functionality is somewhat similar to some cloud services, your files are not being stored on some server elsewhere; they're stored on your NAS, which you have physical access to when you return from your trip, as well as remote access to via the web or app. NAS devices start as low as about $100, but can cost upwards of $1,000 or more for greater capacity and functions, such as multiple RAID configurations. The WD My Cloud family covers a broad range of products, from single drive to multi-drive, and with a convenient mobile app. The Seagate Personal Cloud series, which replaces the older Seagate Central product line, is similar in scope to WD's offering. The NAS options from Synology and QNAP generally target higher end users with more advanced, technical requirements. 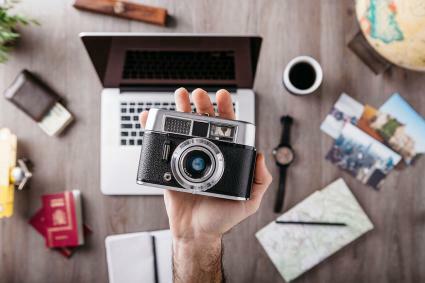 Particularly in the case of point-and-shoot cameras, action cameras, digital SLRs and other similar cameras, it can be a great idea to bring a laptop along with you. If you have a good-sized hard drive on board, you can copy all the photos from the SD cards on your cameras to your laptop. If your laptop has a DVD burner or you choose to bring along an external DVD drive, creating data discs periodically with your photos and videos may be a good idea as well. An external hard drive is another option. Ideally, you'll want to keep all your photos on your SD cards so you can keep multiple, redundant copies in case any one of them fail for any reason. As such, it's prudent to bring more SD cards than you think you'll need for your trip. If you like the idea of backing up your photos and videos to an external hard drive, but you don't want to bother with the added complexity and inconvenience of carrying around a laptop, a dedicated backup device might be worth considering. They all come with a memory card slot so you can transfer your images and videos easily to the on-board storage without the need for a computer. The GNARBOX is rugged and outfitted with a super fast solid state drive (SSD). Prices start around $300 for 128 GB. The WD My Passport Wireless Pro offers one-touch SD card copy and wireless storage. Prices start around $150 for 1 TB. The Sanho HyperDrive ColorSpace UDMA 3 features a handy display for easy file management. Expect to pay about $350 for a 500 GB model. Products like these have their respective strengths and weaknesses, but they are functionally quite similar. If you plan on being away from home from a while and cloud storage may not be completely sufficient for your needs, a quick and easy solution is to invest in a number of inexpensive USB flash drives. Copy your photos over to these thumb drives and mail them back home to yourself. A typical 16 GB flash drive can be had for as little as $5 and even 64 GB drives are available for about $15. Postage should be cheap too, as they are so small and light. Whether you are backing up mobile photos or the pictures you take with your dedicated digital camera, DSLR or otherwise, it's important to create redundant copies in case anything goes wrong with any of them. Utilize a combination of the solutions above that best addresses your specific needs and circumstances while staying within your budget. Try to include at least one "off-site" tactic in case your own gear gets lost or damaged.